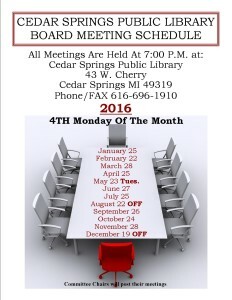 Cedar Springs Public Library is a member of the Lakeland Library Cooperative. Please use the search box below to find materials from forty-one participating member libraries throughout West Michigan. Your search results will be displayed in a new window via Lakeland’s online catalog system. Search the Lakeland Library Cooperative System with more robust search settings. Locate a wealth of eBooks for your devices such as iPads, Tablets, Kindle Fire, Nook/Sony and others! If you can’t find what you are looking for through the Lakeland catalog system. Try searching the MeLCat catalog system, that searches libraries all throughout Michigan. MeL is the Michigan eLibrary, a 24/7 online library for Michigan residents.